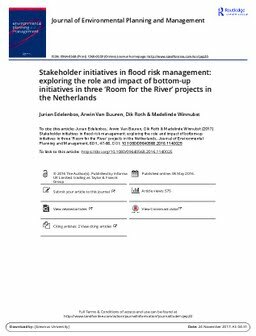 In recent years stakeholder participation has become a popular topic in flood management. Little is known about how and under which circumstances local stakeholders initiate and develop successful flood management strategies and how governmental actors respond to them. Drawing on theories of social movements, stakeholder participation, and citizenship, this paper analyses how local stakeholder initiatives in the Dutch ‘Room for the River’ programme evolve and, in turn, influence such governmental plans and actions. The description and comparative analysis of the three cases leads to three conclusions: first, in all cases, forms of local self-organization play a role, but its impacts are highly dependent on the mix of strategies chosen. Second, forms of coproduction between local stakeholders and government actors are the most viable strategy to realize the positive impact of local initiatives. Third, government agencies tend to react to local initiatives defensively. Much depends on timing and connecting to the right people.